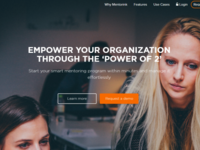 Mentorink provides an online mentoring platform that enables organizations to start and run smart mentoring activities at scale in a very effective and efficient way. It enables you to transform ineffective mentoring programs that lack guidance and monitoring capabilities into structured and result-oriented development experiences. A very innovative and user friendly solution to manage our mentoring program online. Pros: As an educational institution, our top priority is to establish a reliable channel between our alumni and students to enable them to share experiences and grow together. We had organised mentoring programmes historically but it was always very hard for us to manage. We very much struggled to handle large groups of people with offline tools. Mentorink has made the process extremely easy for us. We can now onboard thousands of people instantly, find the best matches instantly and the system provides all of the guidance automatically. Plus, we can get full visibility over the analytics and ensure that our programme is really contributing to the success of our participants. Mentorink has transformed the whole process from being very effort-intensive into a very easy one. Cons: The programme works very well for us at the moment and we look forward to receiving new features. It is really helpful to meet other people in this program and to take advantage of their suggestions and experiences and to direct them to the future. Pros: Mentorink removes the time and location barrier among our employees across 8 countries and enables us to learn from the experiences of each other through a low-cost solution. The smart mentoring activities help us unleash our own potential and accelerate the individual and professional development within our company. Mentorink is a great platform to gain experience in that area. Pros: Mentorink offers diffent ways of communication between Mentor and mentee. This is the best ability of website. Overall: I found a chance to improve my mentoring and coaching skills in a productive way. Mentorink is so easy to use. It's a big opportunity for people who want to improve their mentoring skills. Mentorink is a high quality program that serves our corporate exchange and connects us efficiently. Pros: The software is very user friendly, the team is open to customization, and their help desk is available whenever there is a need. Overall: We got rid of the time and place limitations to connect with each other. As our company is located in 8 different countries, the space and physical touch might get hard; but with this software we got rid of these problems which can create a big burden in todays fast moving world. I had a mentee for 15 sessions and it was a great learning and development for both of us. Pros: User friendly and very simple to use. It has video conference features which makes it a complete platform for you to communicate to your mentee/mentor. Cons: The messages in my inbox did not turn to as read even though I read them. This is something should be improved. I had a wonderful experience with my mentees during the program and also learned a lot! Pros: To able to share my own experience with my mentees and to make a difference in their life's made me very happy. I have also learned lots of new things from them. This type of communication can really make a difference. One of the most impottant thing is a correct match of mentees and mentors regarding their expectation and experiences in their lives. In this concept I felt grateful regarding the matches with my mentees.